First let’s answer the questions; What is a soffit? What is a fascia? The soffit is the surface under the overhanging segment of a roof eave. The purpose of a soffit is to aide in the ventilation of the attic. The air from the soffit rotates around the vents in order to pull heat and moisture away from the home. The function of the soffit prevents moisture build-up in the attic that can develop rot in the sheathing and rafters. The fascia is a vertical border linked to the ends of the rafters, or the area where the gutter is connected to the roof. The key function of the fascia is to protect the wooden board against water damage that can occur over time with the many seasonal weather changes. 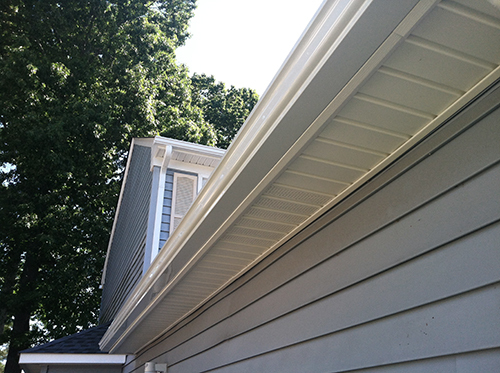 J. Montes Inc. Roofing Systems can replace your soffits with aluminum or vinyl soffit. The purpose of aluminum or vinyl soffits is to create proper ventilation and increase the air flow ventilating your home. This will cut the cost of your monthly electric bills! Fascia Wrap for your wood trim will give your home a cleaner, more refined look. We custom wrap all fascia to create a beautiful home exterior that is maintenance free. All damaged or rotted wood will be replaced in order to eliminate future damage and diminish your need for exterior upkeep such as painting and staining each year. Fascia wrap is a metal product created to make your fascia board maintenance free by covering it with metal. You eliminated the need for future painting, thus making the choice cost effective. Fascia wrap is available in a wide assortment of colors, although white seems to be the most popular. Fascia is in a 6” or 8” contour with a 1 ½” – 90 degree bend to protect your wood fascia board and remove continuous maintenance. exterior of your home to becoming maintenance free!